West Bond sits deep in the Pemigewasset Wilderness and one of the most remote peaks in the White Mountains.. Views from the narrow bare summit are magnificent and well worth the miles logged to reach it. 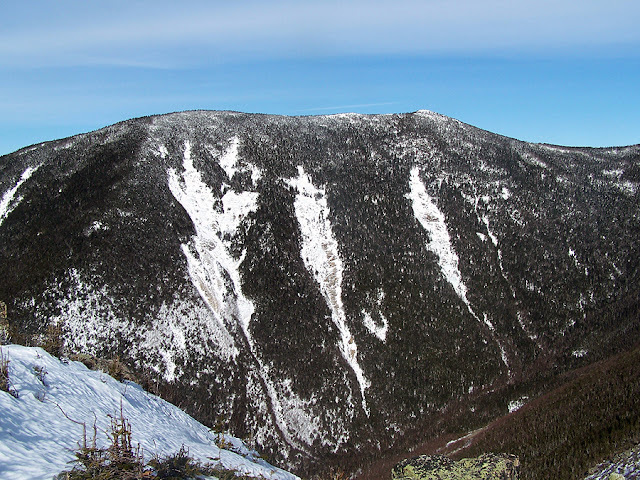 West Bond can be reached from Lincoln Woods off the Kanc (Route 112) via Lincoln Woods/Wilderness Trail, Bondcliff, and the West Bond Spur Trails. Another way to reach the summit is from Zealand Road via the Zealand, Twinway, Bondcliff, and West Bond Spur Trails. The Guyot Campsite is within a mile of the summit of West Bond off the Bondcliff trail. -Lincoln Woods/Wilderness / Bondcliff / West Bond Spur Trail: 11.3 miles, elevation gain of 4,100 feet: The LW/Wilderness trail is an old logging road that runs deep into the Pemigewasset Wilderness, it is flat and has old railroad ties on the trail. It is not the most exciting trail but is easy on the feet to the Bondcliff Trail. The Bondcliff Trail has moderate grades with ok to rough footing. There is one steeper section halfway up to Bondcliff and then a short steep pitch with a very minor scramble just before reaching the exposed ridgeline. Once above this section views become incredible as the grades become easy over Bondcliff before dropping down into a small col and heading up to Mount Bond. The Bondcliff Trail descends to the West Bond Spur Trail just above the Guyot/Bond col. The West Bond Spur Trail descends moderately and the ascends moderately with good footing to the open summit of West Bond. The 1.2 miles between Bondcliff and Bond are above treeline and exposed to the weather so caution should be used in high winds and deteriorating conditions. -Zealand / Twinway / Bondcliff / West Bond Spur Trail: 7.2 miles, elevation gain of 3,250 feet. The Zealand Trail has mostly easy grades with good footing as it leaves the end of Zealand Road off Route 302. The Twinway (A.T.) has moderate to steep grades with ok to rough footing. The first section of the Twinway is steep as it ascends past the Zealand Falls Hut, grades moderate with some short steep sections as it makes its way to Zealand Mountain. From the Zealand Mountain Spur Trail junction the Twinway drops down into a col between Zealand and Mount Guyot and then ascends over rough rocky boulders until popping out above treeline at the northeast summit of Guyot before dropping down to the Bondcliff Trail junction with stunning views to to Owl's Head and across to the Franconia Ridge. The Bondcliff Trail has moderate grades with rocky footing as it ascends to Mount Guyots open summit which has tremendous views in all directions. From here the Bondcliff trail drops down into a wooded col and ascends to the West Bond Spur Trail just past the Guyot Campsite spur path. The West Bond Spur Trail descends moderately and the ascends moderately with good footing to the open summit of West Bond.